Inventory We are a resale marketplace, not a box office or venue. Ticket prices may exceed face value. This site is not owned by Wells Fargo Center . 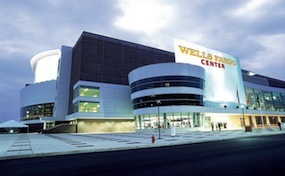 Wells Fargo Center in Philadelphia has been the premier venue to catch events in the state of Pennsylvania since its opening on August 12, 1996. It is the home to the National Basketball Associations Philadelphia 76ers, the National Hockey Leagues Philadelphia Flyers, the NLL's Philadelphia Wings, and the Philadelphia Soul of the AFL. It has hosted many big events including the NCAA Tournament, NBA All Star Game, US National Championships, Stanley Cup Finals, World Cup of Hockey, and many more. Wells Fargo Center is conveniently located at the southwest corner of the South Philadelphia Sports Complex, which includes other venues such as Lincoln Financial Field, The Spectrum, and Citizens Bank Ballpark. CenterPhiladelphia.com is a privately held company that specializes in the sale of tickets in the secondary market. We are not affiliated with any official supplier or box office. To purchase tickets to any Wells Fargo Center in Philadelphia events simply call our operators at anytime or click on the event you wish to attend.